A "These things ebb and flow," he said. "Prices of paintings like everything else, aren't set in stone. He is a major figure, whatever you think of him. He's Mr Brexit, isn't he?" The commission was suggested by a mutual friend of the artist, whose other subjects have included Prince Charles and rugby star Shane Williams. 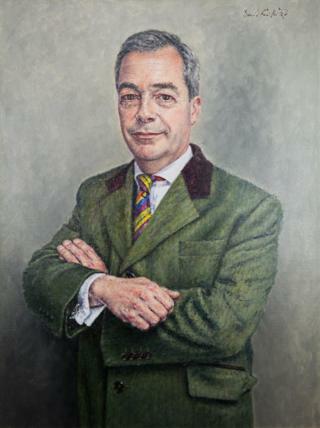 A key figure in the 2016 referendum campaign, Mr Farage has pledged to return to frontline British politics this autumn to fight for Brexit,The portrait of the MEP and former UKIP leader, in his trademark tan-coloured coat and striped tie, was not the only politically-themed work not to find a buyer. A ?350,000 work by the artist Banksy entitled Vote to Love, featuring a heart-shaped balloon superimposed over a UKIP referendum poster, also remained unsold.But a painting of another prominent Brexiteer, Conservative MP Jacob Rees-Mogg, did fetch ?450.